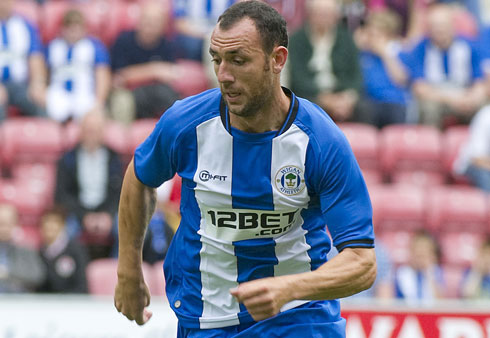 Wigan went toe-to-toe with Champions-elect Leicester City in an entertaining 2-2 draw at the DW Stadium. With three minutes of normal time remaining Latics looked to have secured the three points but Dean Hammond headed home to keep open the Foxes chance to confirm their promotion to the Premier League on Saturday. Wigan had taken a 37th minute lead through Ivan Ramis’s header but Andy King replied on 41 minutes. Rob Kiernan’s first ever goal looked to have won it for the Latics, but Hammond’s late header denied what would have been a deserved victory for the home team. In a frantic opening to the game chances were created by both teams. Liam Moore’s header was cleared off the line by Ramis and then the central defender nearly got on the score sheet at the other end when he headed wide from Jordi Gomez’s pass. Latics continued to go forward with Gomez at the centre of their best moves. Maynard mis-kicked following Powell’s pass and then Gomez fired narrowly over from Crainey’s cut-back. Wigan’s good work paid off in the 37th minute when Gomez’s superbly floated free-kick was met by Ramis who powerfully headed past Leicester keeper Kasper Schmeichel. But the lead lasted only four minutes as David Nugent fed Andy King inside the box, and the midfielder calmly slotted the ball past Ali Al-Habsi and in off the far post. Leicester showed why they are the Championship leaders with some incisive counter attacking play, but the teams went into the interval level. On sixty minutes James McArthur produced a stunning 20 yard drive which Schmeichel did well to tip over, and from the resulting corner Latics took the lead when Kiernan headed home at the near post. Wigan proceeded to create a catalogue of chances to put the game to bed. Substitute James McClean looked to have increased their lead but despite getting his shot past Schmeichel, Wes Morgan produced a last-ditch goal-line clearance. McClean was posing a major threat down the left hand side but as in other recent games his final pass or shot was disappointing. Leicester substitute Riyad Mahrez had a great chance to equalise for the Foxes, but he blazed over when unmarked in the Latics penalty area. Gomez then forced another save from Schmeichel as he broke positively from midfield and fired in a low drive. Emmerson Boyce might have sealed it for the Latics on 84 minutes when Jack Collison’s shot deflected into his path, but the skipper couldn’t make a proper contact and the ball flew wide. But Leicester were not going to relinquish their unbeaten run without a serious fight and with Latics tiring, Hammond got on the end of a Mahrez free-kick to head past Al-Habsi from 10 yards out. Leicester’s unbeaten run in the Championship now extends to 20 games and it appears to be only a matter of time, when, not if, they will be promoted. Wigan continue to show excellent form under Uwe Rösler, losing only three of their last 26 games in all competitions. Promotion through the play-offs certainly looks like an attainable goal. This entry was posted in Andy King, Championship, Dean Hammond, Ivan Ramis, Leicester City, Rob Kiernan, Uwe Rösler, Wigan Athletic and tagged Andy King, Championship, Dean Hammond, Ivan Ramis, Leicester City, Rob Kiernan, Uwe Rösler, Wigan Athletic. Bookmark the permalink.